When I started this blog in 2003, near the bottom of the personal information that's always been linked from my sidebar, I included an explanation for the origin of my nickname, "Beldar," during my days as a member of the Finquo Pledge Class of the Longhorn Band's Kappa Kappa Psi service fraternity 30 years ago. Taken in the stairwell of the Music Building East at UT-Austin, this shows four of the Fingquos — left to right, me, Dan Gremminger, David Schkade, and Richard Taylor — snarling as we prepared to present our Saturday Night Live/Coneheads skit at the weekly KKY meeting after band practice on a Tuesday evening in the fall of 1978. 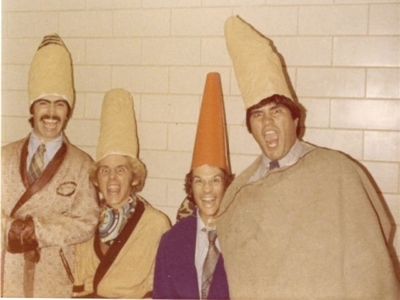 The nickname came as a result of Richard's beer-impaired processing of my name a night or two before, as we were planning the skit — "Bill Dyer, Bihl Dahr, Behl-Dahr, Bel-Dar, hey, BELDAR!" Damn, we were young and good-looking. Mips! Nice tie, goes with the hat. That mustache is just one of the many reasons that I'm terribly jealous of your accomplishments and swear to give you a wedgie at the earliest opportunity.